Located one (1) block from the DISNEYLAND® Resort, this family friendly property offers spacious guest rooms for your family vacation. 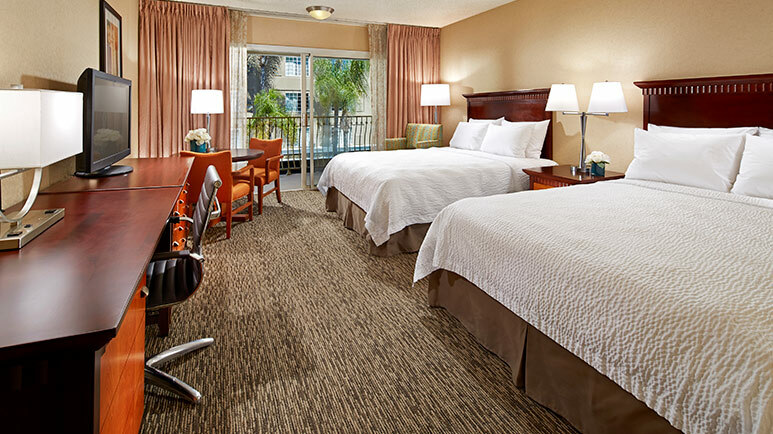 Choose from either a standard hotel room or a kid’s suite to best suit your needs. My kids loved the bunk beds!! They’ve always wanted to stay in a room with bunk beds. Front staff was nice and check-in was easy. We weren’t at the hotel much but it was a great place to call home at night after a long day at Disney! We loved the size of the room, the ability to close out the kids so they could sleep while we cleaned up and such. The staff was always friendly and courteous. Having a small fridge and microwave helped us save some money by eating in the hotel. Overall the room was nice and worth the money. My only complaint was in the bathroom, the tile grout looked really bad in some places. I went to take a bath to try to soak away the pains of the day and especially under the soap dish, it was unsightly. The bottom of the bathroom door looked warped from water but it hadn't been replaced, just painted over. Other than that, we loved our stay. Conveniently located for both walking to the park and the ART bus system, the latter we used frequently. Limited parking available, but we didn't mind as we had come by train. IHOP across the street, a tiny convenience shop located downstairs and a CVS practically next door which made picking up cheap souvenirs or forgotten hygiene products way easy. We had several food deliveries and grocery deliveries which weren't a problem either. I'd say with a refurbishment of the bathroom, it would be perfect. Perfect for family w kids! Perfect setup for family w/ multiple kids. Visted Disneyland last week w. our 3 kids under 6 and couldn't have been a better situation. Bunk beds for the older kids, they had a pack n play setup for the baby. Rooms were clean and king bed was great for my wife and I. All within a half mile from front gate at Disneyland so we never had to get in our car once we got there. And for the rate you pay, can't even compare. This is our second time at Portofino and if/when we go back to Disneyland we will stay there again. This hotel was a bit ran down. The first room we were in the air conditioner would not turn off. The water in the bathtub sprayed everywhere. I contracted the front office and they did put us in another room but the hotel needs to have some upgrades. On the positive side the swimming pool was heated and that was nice. I chose this hotel based on a recommendation of a friend (who stayed there years ago) and its location relative to the park entrance. The pros are definitely the location, also the super wonderful air conditioning and the hot water at any time of day in the shower. The room also had the amenity of a working small refrigerator. However, the big con and the reason we won't stay again is the lack of comfort of the beds. We booked a room with two queen beds, both of us woke up every day more stiff and painful than the night before. The pillows are very small and they vary slightly between too full/firm and slightly less firm. Also, there was mold on the ceiling in our bathroom (as per most Southern California hotels there is no fan in the bathroom) and the ceiling creaked constantly with any movement from the people in the room above ours (they got up at 5:45am each morning of our stay and it sounded like the roof was going to collapse as they walked around). The parking lot is very small and similar to most other reviews we had to circle the lot to find a free spot, a couple of cars were double parked illegally or in areas clearly marked with No Parking Any Time signs. We were told following check in that we were allowed to park in the multi-floored parking structure located behind the hotel, however we'd need to get our parking validated to avoid being charged for use of the structure. Lastly, for those looking for beautiful room amenities, look elsewhere: the furniture is dated and scuffed up significantly, the walls have scuff marks, the drapes had stains on them, the towels were small and had hair from another person (someone with long dark hair) on them, the shower curtain was ripped at the top, the bathroom door frame appeared to have been repaired at some time (had the appearance of water damage that was patched, but unsure), there was a carcass of what I assume was a silverfish bug in the light fixture in the bathroom. There were two elevators we could use to access our rooms, the one that was closest to our room was quite slow and the doors made a strange noise upon closure (squealing as though rubbing inappropriately against internal structures) and made us nervous, we took the stairs for the entirety of the trip. This hotel is fantastic on location, the cleaning staff were efficient, but I think the hotel in general is in desperate need of an overhaul. Keeping in mind this hotel would be considered a "Value" hotel, it had the same amenities, rooms, bedding, pool that you would expect for the price point. Let me go over the good points. 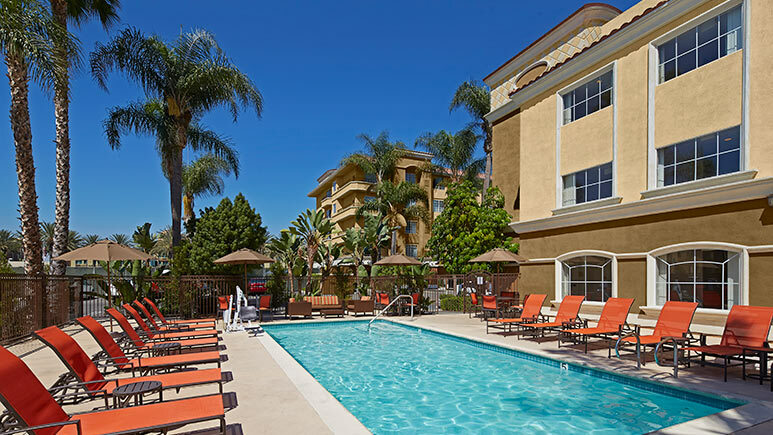 It has a 15 minute walk to Disneyland, rooms have been updated in the last 5 years, in room fridge worked great, room had a balcony with chairs and sliding glass door, CVS is next door, staff was nice. Now the negative: I had to kill two cockroaches this is a first for me in a Disneyland area hotel. I know my wife will never stay here aging due to that. As with most hotels close to the park, Parking is an issue, we had to drive around the parking lot a few times just waiting for a spot to open up. To sum up, It's an OK "Value" hotel, don't expect the best but it's not the worst. If I could give a 0 I would!!! We get to the hotel and the AC in the room we requested was broken (things happen I get that) so that meant no roll in shower for mom. We made due! BUT the fan in the bathroom didn't work and when we told the front desk all she said was "the fans in the bathroom are not good so it's ok". Then on one of the days we came back to our room our key was not working at ALL we couldn't get in our room! I was about to go down and get a new key when my husband pushed on the door and it just opened!!! The maid did not shut the door all the way!!! We are lucky nothing was stolen. The hotel just said we will talk to the maid and that the keys stop working early so that's why we couldn't get in!!! (Really they stop working!??) and then when I told them the maid never left us toilet paper or wash clothes I was told that was something I had to specify that we wanted!!! I am very unhappy with our we were treated! Also when they sent maintenance up to check the door all he did was use his key and said it works and walked away! If you want a cheap hotel stay here but you will be treated like crap so be prepared! Good parts: This hotel is pretty close in walking distance- we stayed in the bunkbed suite. The doors to the bunk bed rooms are see through, we had to hang towels up so the kids couldn't see our lights on while they slept. The bunk bed room was pretty spacious with a pull out couch- CVS is right on the corner and convenient for last minute things Bummers: the shower didn't drain, stood in 2 inches of water while showering. Hair on the wall when we arrived and mold at the bottom of the shower curtain. - carpet was filthy, my kids were barefoot and looked like they had been playing outside Room was older and could use some updating. The hallways and elevators were stifling hot!!! I probably won't be staying here when we come in another year-expensive for what we got vs. we paid. I loved the hotel very clean and close to a lot of restaurants. I would of gave 5⭐️'S if they offered breakfast. Staff was very pleasant, I definitely recommend this hotel. We showed up close to 5pm and there was no room available even though it should have by 4pm, we then waited an additional 25 minutes to get our room. We tried calling front desk once in but the button did not work to get thru, so we had to walk down to ask for more pillows which they were out of. We stayed here with a family of 6, enough space for us, could have used some more mirrors besides the bathroom for others to get ready. Room could use some new carpet and tanle/chairs. We ordered pizza and had to eat on the beds. Walking distance was about 2 blocks which wasn't bad at all. CVS & Walgreens at both corners. Pool was basic small pool but warm for the kids. Would have been nice if there was breakfast, that was a downside. Lots of beds in the suite. Door between kids and parents is see through. Overall it was a nice place. Location is great!! The hotel room was small for my family of 5. No counter space at the vanities. Old and run down, definitely needs some updating. The lighting is horrible as well as the placement of any outlets. With a hot steamy shower the light in the bathroom would flicker, short out and then shut off so you would shower in the dark. If you were lucky you get it back on later in the day. Parking is a joke! I don't like to be a whiner but I have stayed at better places. We had a great experience with this hotel and it was perfect for our family with the bunk beds in a room that we could close off with sliding doors after bed time. The location was great, everything was clean and the staff was very courteous. The only thing that wasn't awesome for me was that the mattress on the king bed was not great. I would definitely stay here again! The best thing about the Portofino was the easy walk to Disneyland. The rooms need some updates and seemed dingy and used. The kids suite was average size but it did comfortably fit 5 of us just not the quality of room that we are used to. This hotel is now dwarfed by the newer Residence Inn and Hyatt Place across the street. We stayed here last year and it worked perfect for me and my family of 5 at the time. This year it was a total of 8 of us and we stayed in the kid suite again so worked out great. There is a king size bed, pull out sofa not the comfiest but it works and then a set of bunk beds. I like that fact it has sliding doors to separate the living room from the room makes it nice. Loved how there is 2 sinks one in the bathroom and once outside of it. Parking not that great but you are allowed to park in the garage right next to it for free so wasn't an issue literally right next to the hotel. Loved how close the park is and best part so many stores. There's a CVS downstairs, Walgreens across the street and 7-eleven as well. Also a coffee shop down stairs behind the hotel and a pizza hut to. So many food places to walk and eat across the street. I really enjoyed our stay, only thing I would say is maybe a coffee table or end table just for extra counter space. Dirty, run down, and no breakfast. We got there and found out the shuttle cost money. 5)8/ wasn't to bad because it is at least close enough to walk without to much effort. It was really nice to have a kids suite but I was the curtains weren't covered in stains and the walls didn't have holes. The bed was clean though. The shower drain was broken and would fill up when you would shower. They told us they would bring a crib to our room and then never did. We had to call at night to remind them. The elevators are honestly a little scary. Overall it was Disneyland that made the vacation and the hotel we put up with. The hotel is located close to Disneyland which is the positive. Other than that, the pool was ok. It was stated that it was "heated" which it wasn't. There were no pool towels. After asking for some at the front desk, 20 minutes later we had to borrow some from the maid cart. There was a drain by the pool that was plugged and caused a huge puddle on one side of the pool. The room was clean, however, not functional for 6 guests. There was no room or counter space. The parking was horrible. I would not recommend this hotel. I will spend a little extra money next time and gaining more quality and a hotel that offers breakfast. I do not recommend this hotel at all, I took my five year old grand daughter for her birthday. We checked in on June 1st and checked out on June 2nd, my grand daughter had bed bug bites all over her body from her face to her feet. They went in and inspected the room and took pictures to show me that they did not find any bugs??? When we arrived on the 1st she did not have any bites on her body but the next morning they were everywhere. I told them I could take pictures of the bites if they wanted but she was standing right in front of them and they could see three on her face?? The did try to accommodate us by moving us about two doors down on the same floor as the first room. I asked to be moved to their other tower and they did move us. I just was not comfortable however just knowing they had bugs in the buildings, so I called getaway today and they moved us to a different hotel. 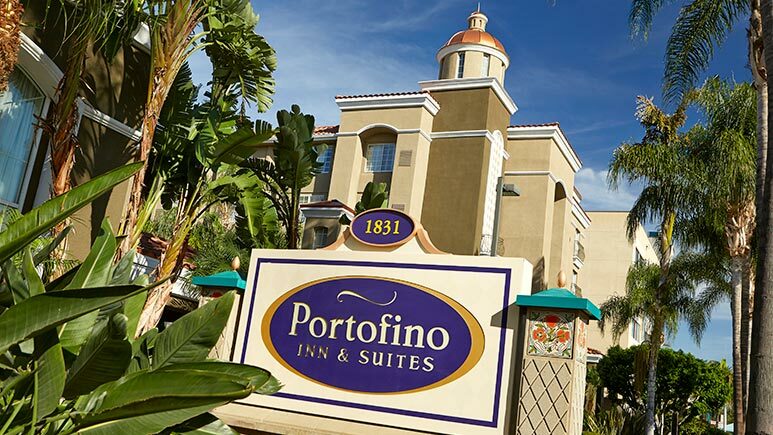 Portofino is in an excellent location from Disneyland itself, very short walk which was convenient but the bugs were just not worth that convince in my mind.I really would not recommend staying here, it was slightly cheaper than other properties, but spend the extra money to make sure you are getting quality. Getaway put us in a hotel called the Ayers Hotel, for very close to the same price as the Portofino Hotel and it is very new and very beautiful. You also get a breakfast in the morning which was a plus, the location is not close to the Disneyland Resort you must take a shuttle back and forth but very reasonable priced. Again be careful staying here, look into other properties. PROS: The hotel was within walking distance to/from Disneyland. We were there for 8 days and had tickets for the ART (Anaheim Resort Transit) and only used it once - it was almost as fast to walk. The hotel is the first stop for the ART, making it a great option for leaving the park, but you are the first pickup when going to the park, so it's about a 20 minute ride. The room was clean and the maid service was great. There is a CVS right next door - very convenient. There is a coffee/tea shop right around the corner - also convenient. CONS: The parking situation is not great. They have a small parking garage in addition to a small parking lot, but there was never an open spot. They have made up for this issue by having a valet that takes your car to the Sheraton next door. BUT we found the valet hard to track down and when we requested our keys and wanted to get our car ourselves, we couldn't get out of the secure Sheraton parking lot. Parking was included with our vacation package, so it's either pay at another hotel for convenience or deal with a slow parking setup. The pool is great - hot tub was nice and hot. Pool was not huge, but it also wasn't very crowded. The downside is that there is a large parking structure going up right next to the pool (they almost share a fence). In addition to the jackhammers and constant construction noise, the height of the building has blocked a lot of the afternoon sun. Kind of a bummer, we just made adjustments to swim early if we wanted sunshine. There is NO restaurant in the hotel. No room service, no breakfast, no food. The rooms do have a microwave and small fridge, so we stocked up on snacks/cereal/popcorn at Target and knew we would have to eat elsewhere. They have a large gift shop and again, CVS is right next door. Overall, this was a great pick for our family (2 adults, 2 kids, ages 8 and 9). We had a family suite with the kids in bunk beds and adults sharing a king bed. The room basically has sliding doors in the middle, therefore, not sealing the kids off completely (they could hear our TV, talking, etc.). Would have preferred an actual door to shut, but we made it work. The pros definitely outweighed the cons and we would stay there again - for the location alone! Very clean hotel. First time staying and loved it ! The hotel was good, but could have been cleaner. The layout in the family suite really isn't very logical. A refrigerator and microwave are in the room but there is no place to prepare the food. No working counter space. We used the ironing board with towels to make sandwiches for the kids. The vanities could have been larger as well. When you have a family you have alot of bathroom items. Most of the vanity space was taken up by the coffee pot and ice bucket. Again it has to do with working counter space. All though the rooms were cleaned everyday, on the last day the custodians spilled something on our bed. When we got back to the room our blankets, sheets and mattress was sopping wet. Although they brought up clean sheets, they didn't remake the bed, clean our blankets or explain what had happened. Very helpful and patient attendants. We arrived in 2 cars very early in the morning, and they took our luggage, parked one car for the day before we could check in. The place definitely needs more parking. Paying $20 a day for overflow isn't right. Over all we had a good time. Thank you for asking. The beds were comfortable, the TV was good and they had working Wi-Fi which was a plus. The only thing was they had limited parking available. So they used valet parking where they parked my car in a whole other lot. The nice thing about this hotel is that it has an extra sink outside of the bathroom. There is a sink inside the bathroom and one outside, this makes getting ready in the morning so much easier. We had two rooms and the hotel was generous and gave us an upgrade to a family suite at no charge so that our rooms were right next to each other...but they are not adjoining.